4. Pain modulation: From CPM to placebo and nocebo effects in experimental and clinical pain. 5. Modulation of the motor system by placebo and nocebo effects. Neurobiology of the Placebo Effect, Part II, Volume 139, the latest release in the International Review of Neurobiology series, is the second part of a two-volume set that provides the latest placebo studies in clinically relevant models. 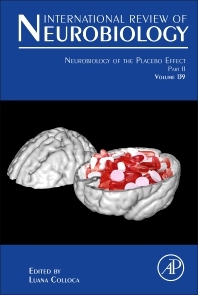 Specific chapters cover the History of placebo effects in medicine, Lumping or Splitting: Towards a taxonomy of placebo and related effects, Theories and brain mechanisms of placebo analgesia, Pain Modulation: From CPM to placebo and nocebo effects in experimental and clinical pain, Modulation of the motor system by placebo and nocebo effects, and the role of sleep in learning placebo effects, amongst other topics. Professionals, researchers, clinicians and students in the psychology, medicine, basic and clinical neuroscience sector.